A unique Madrepore dining set by Gio Ponti and Pierro Fornasetti hammered for $173,000 at Wright in Chicago on March 27 - 92.2% up on the $90,000 estimate. Fornasetti (1913-1988) was an Italian artist and designer whose distinctive work remains enormously popular. His most famous designs are those that use variations on the face of opera singer Lina Cavalieri (1874-1944). 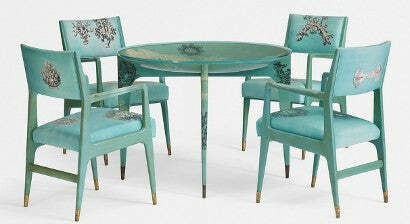 In the 1940s, he began to collaborate with architect Gio Ponti (1891-1979) on a furniture range. The two men worked together regularly until Ponti's death in the late 1970s. The dining set features lithographs of corals and sea creatures on lacquered wood and glass. The record for a piece by Fornasetti remains $230,000, set for a unique architettura trumeau cabinet in 1998. An important wall mounted cabinet by George Nakashima made $106,250 - an increase of 51.7% on a $70,000 estimate. It was produced in 1967 and displays the artist's trademark "free edge" style, where the shape of the finished piece is dictated by the natural form and grain of the wood. Nakashima (1905-1990) was a significant member of the American arts and crafts movement and one of the greatest carpenters of the 20th century. His auction record was set at $822,400 for a redwood burl and black walnut table at Sotheby's New York in 2006. Check out our varied range of English antiques here. Why not sign up for our free newsletter?